Goodness, I've been away from this blog for a full year, almost to the day. And what a year! I've been 'crazy busy' working to establish my infant jewellery (or should I say jewelry?) business, True Colours Pearl and Gemstone Jewellery. Heartfelt thanks for great support to: my 'in-house' designers, Aoife and Stephen; Claire and Gerry; my county enterprise board, Dun Laoghaire Rathdown (DLRCEB); friends / cheer-leaders from CEB networks; colleague, mentor, cheer-leader, Ann Mulcahy; and my many colleagues and clients from the worlds of education / colour therapy. Commissions and appreciation from people overseas (thank you, Michigan, Australia, Dev Aura and Switzerland!) 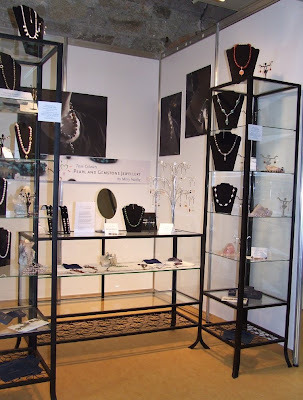 decided me to take the plunge and exhibit at the Crafts Council of Ireland's annual trade fair, Showcase 09, over four days in January.